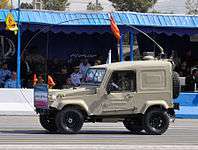 Safir (Persian: سفیر‎‎, meaning "ambassador") is an Iranian 4x4 multipurpose military vehicle built by Fath Vehicle Industries. This vehicle was officially unveiled in 2008. 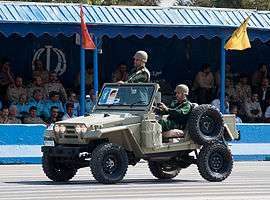 In the ceremony, Iranian defense minister said that 3,000 Safirs were built in that year, and Fath industries would deliver 5,000 more vehicles to defense industry per year. A version equipped with 12 Fajr 1 107 mm rocket tubes. Safir can greatly enhance Iran's ability to transport its units across the country and also improves the maneuverability of the Iranian forces across the battlefield. Also it acts as fast transporter of Fajr 1 rockets, 106 mm recoilless rifle and Toophan anti tank missile. ↑ "View image: 4f". Postimage.org. Retrieved 5 February 2012. 1 2 "View image: 2f". Postimage.org. Retrieved 5 February 2012. 1 2 3 "واحد مرکزی خبر | IRIB News". Iribnews.ir. Retrieved 2012-08-15.